Standards are being set at the newly refurbished Royal & Derngate Theatres. ‘Follies’ has continued where previous in-house productions left off before the closure last year, maintaining a high standard of entertainment and now the first amateur show in Derngate has set the marker for future shows to follow. 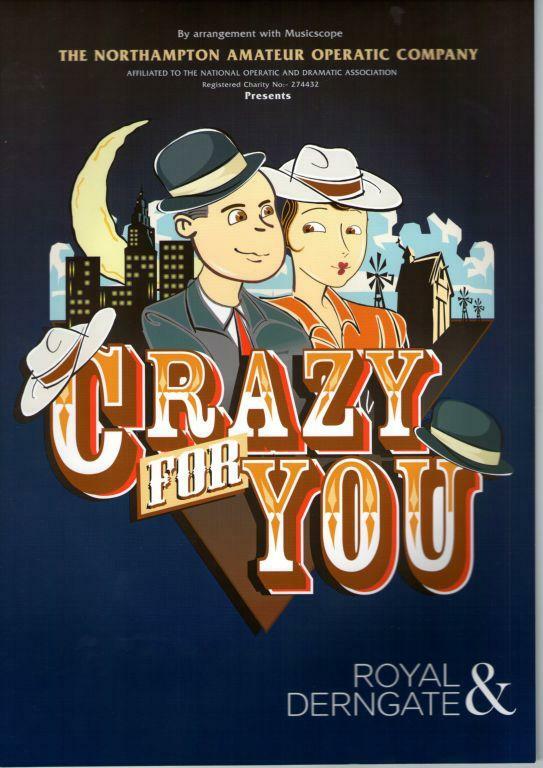 Northampton Amateur Operatic Society’s version of the musical ‘Crazy For You’ is quite simply magnificent. From the standard of singing and dancing to the set and costumes everything was of a high calibre. For those who don’t know the musical, it follows a community in Nevada trying to save the Gaiety Theatre from closing. Bobby Child arrives from New York and instead of following what his mother wants him to do, he falls for local girl Polly. Under the guise of theatre producer Bella Zangler, he tries to help put on a show to secure the theatre’s future. The show has some great musical numbers such as ‘They Can’t Take That Away From Me’, to the foot stomping, ‘I Got Rhythm’. Each of them was performed superbly, whether it was a lead character or the whole company performing. And a special mention has to be given to the set designer. The set revolved and moving easily, changing from a western looking street in Nevada to the bright city lights of New York. Overall the group which performed the show maybe amateur in name but I think any professional company would be proud of a production like this. It’s a big challenge, being the first amateur group to return to the Derngate stage and, for the most part, the Northampton Amateur Operatic Company rose to the occasion with their colourful production of Gershwin musical, ‘Crazy For You’. The feather light tale, of a New York Banking heir who dreams of dancing and falls in love with a Nevada theatre owner’s daughter, is carried along by its superb music with classics such as ‘I Got Rhythm’, ‘Someone to Watch Over Me’, ‘Embraceable You’ and ‘Nice Work if You Can Get It’. David Russell, in the leading role of Bobby Child took to his first performance at The Royal & Derngate like a duck to water, carrying strong solos and comedy scenes with aplomb. He was ably supported by NAOC stalwarts John and Lisa Simpson, who carried off their respective roles of theatre impresario Bella Zanger and demanding fiancée Irene with style. The best scenes were one involving Bobby and Bella in a drunken mirror image comedy sequence in the Salon, and the New York based opening, where Bobby sings around a car which disgorges a string of dazzling show girls. The revolving sets were ingenious but the stage crew needed to be more on the ball, as several scenes were spoilt by the sight of people walking around backstage through gaping holes in the scenery or a backlog of people trying to get off the set. Some members of the large cast also seemed to be concentrating so hard on their dance steps that some of the natural gaiety and enjoyment of the numbers were lost. But a few clumsy exits and sound difficulties can’t detract from the fact that this is a two hour, all singing, all dancing show which every member of the cast put their hearts into. Once they relax into their parts I am sure the audience will be shouting “Who Could Ask For Anything More”.